We woke up the next morning dreading the day ahead. 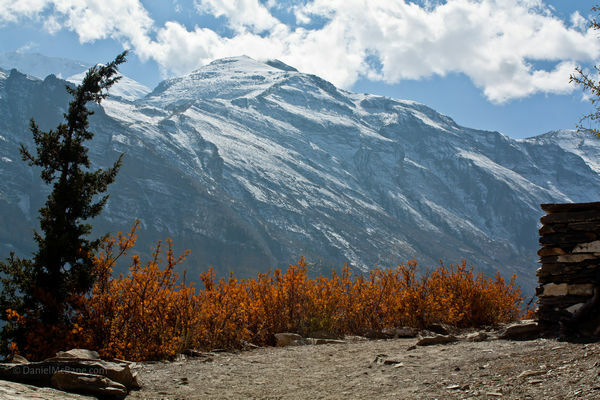 Trekkers have two options on the Pisang to Manang section of the Annapurna circuit: the lower route along the valley floor or the upper route 400 or so meters above. We knew the lower trail would be faster and easier, but we’d heard multiple times that the upper has some of the best views of the whole trek. The promise of incredible scenery was all it took; we chose the hard route and we did so knowing we would have a steep 400 meter ascent ahead of us. This is what we were dreading. We started in that town in the distance and had to climb up to here. By this point in the trek, we had already suffered through a few steep climbs, but none of them came close to this one. When morning arrived, we just wanted to get going and put the whole thing behind us, but we couldn’t. We expected the climb to come directly after leaving Upper Pisang. In fact, I figured we would follow the trail I had the day before, when I climbed above the town to take some photos. Instead, we were kept in anticipation as we walked along a mostly level path for an hour or two, before finally reaching the bottom of our obstacle. We passed these prayer wheels on the way, perhaps the most photographed point of the trek. Red and orange shrubs and the occasional green tree dotted the mountainside in front of us. Switchbacks climbed up among the shrubs and disappeared from view in the distance. We could not see the top. Steep dirt trails ran straight up the mountain, connecting the switchbacks. It would take a lot more effort, but we could quickly cut out big chunks of the climb using those trails. Seeing this woman, my backpack suddenly felt lighter. As much is I was dreading the next hour or two and as difficult as even walking on flat ground becomes in the thin air at 3500 meters, getting up that mountainside proved much easier than expected. I can thank my strategy for that. Basically, I made sure to always stay ahead of my two trekking companions. This was not difficult, since they were carrying a lot more weight than I and one of them was sick on top of that. I would trek ahead, occasionally even scrambling up one or two of the shortcut trails to put considerable ground between myself and the other two. Constantly stopping to take photos slowed me down, but I knew they were doing the same. Once I had a good bit of vertical distance between us, I would find the next bench or rock and have a seat. Sometimes I would have a snack. Eventually the other two would catch up. Naturally, they also wanted a rest and a quick snack; this meant I got twice the break time. When we set out again, I built up another lead and we repeated the process. We did this over and over until we reached the top. The view from the top; unfortunately, we were not there yet. Well, we thought we had reached the top. When the trail leveled off and entered the shade below a clump of trees after we had been climbing for a long time, we assumed we had made it. An old woman was sitting in the shade behind a flat piece of wood supported by two large rocks. Assorted candy bars, drinks and several baskets of apples covered her makeshift table. Two horses stood nearby, keeping an eye on the woman and her convenience store. I’m guessing they were also responsible for hauling her inventory and the tabletop up the mountainside every morning and back down in the evening. I had no interest in the candy bars or the drinks, but couldn’t resist the locally grown apples. We bought a bunch of them. At some point while we were enjoying our apples in the shade and recovering from the climb, one of us noticed that we weren’t at the top of the hill. We still had a steep section of stairs ahead of us. Re-energized after the long break and several apples, we flew up those stairs and emerged on a stone patio attached to a temple at the entrance to the town of Ghyaru. We snapped a few quick photos of the valley spread out below the temple, but our eyes were immediately drawn to another patio, one belonging to a guesthouse. A guesthouse with tables and chairs to sit on and a kitchen that could make us lunch. Inside the guesthouse. I know it’s a Buddhist symbol, but it’s still a little disturbing. Thanks, Hitler! Busy at work. I should look into running a guesthouse in Ghyaru; it may be my dream job. He was also the owner and the chef and the holder of every other job title at that guesthouse and he was neglecting every one of those jobs. Neither he, nor we, cared much. The dogs weren’t much livelier. And looking like this meant no one would disturb their sleep by petting them. After lunch, we took our time walking through town, snapping countless photos. Already, the climb to the upper trail was proving worth the effort; it was clear the views from below were nowhere near as good as the ones we were enjoying. And this was only the beginning. The quick walk to Ngawal ended up stretching out several hours longer than it needed to, mainly because we couldn’t make it five meters down the trail without pulling out our cameras. Not only did this section of the trek provide the best views, it also gave us the best weather so far and that combination was just begging to be photographed—over and over again, apparently. One of the hundreds of photos I took on the section between Ghyaru and Ngawal. We passed a bunch of little religious sites like this one. This was probably our best day of the whole trek and it came because we chose the much harder route. Most don’t, opting instead to follow the river at the bottom of the valley, but they don’t make this choice because that route is easier; they make it out of time constraints. I’ve mentioned it before, but most people seem to race around the Annapurna Circuit in the shortest amount of time possible. That’s a shame. Looking back at the town of Ghyaru. One of the Annapurna peaks. I have no idea which one. I would cut some other part of my trip short and do whatever it took to make sure I could take my time on the trek. When you hurry, you not only miss out on the best section and some great side-trips, you also enjoy the parts you do cover far less, especially once you reach the higher altitudes and end up with altitude sickness, because you gained elevation too quickly. You can see the trail on the left hand side; it then drops down and runs along the river. Obviously, the views from there are not too bad either and far better than anything most of us see on a daily basis. Even hurrying around the Annapurna Circuit makes for a great experience, but taking your time makes for a better one. If you’re going to go to all the trouble necessary to do this trek, it makes sense to do everything you can to make it as memorable as possible. What a fabulous adventure. I’d love to be in shape so I could make this journey, but until I am I’m grateful to let you do the serious walking. I think I proved beyond a doubt that you don’t have to be in shape to do the trek. If you go slow enough in the beginning, you end up being in good enough shape by the time the difficult sections roll around. This trek is perhaps the only form of exercise I’ve ever enjoyed. And on the worst section of all, the one over the pass at 5400m, locals with donkeys wait every 100 feet or so, selling rides to those who prefer not to walk. I won’t lie—of all the brutal climbs we did on the APC, I think this was the hardest and possibly the one where I came closest to quitting. I think it took us nearly 3 hours to make it up to Ghyaru and the fact that about an hour from the top it started to snow certainly didn’t help matters. By the time we (gasping for air) made it to the top, it was a fullblown snow storm and we actually couldn’t see a single peak. Not a very nice reward for all of our efforts! We wound up hunkering down and hanging out there for 2 days waiting for the skies to clear because there was no way we had struggled that high up only to push on with zero views to show for our effort. (I really couldn’t understand the hikers who pushed their way up in the storm and then kept walking when you could barely see 10 meters in front of you… why bother?!?) Those were 2 extremely cold nights where I was actually pretty sure I would die of exposure but when the skies finally did clear, it really was glorious. That said, I think the only reason I was able to do that climb once was because I didn’t know how horrible it was… I’m not sure I could ever do it again. Snow would have definitely killed my motivation, too. The views were the main thing that kept us going, in large part because they gave us an excuse to stop every 50 ft to take a photo. Looking back we did get very lucky with the weather. It only rained for a few hours on one day and I did most of the trek, apart from the section between Manang and the pass, in a t-shirt. Nights were a different story, of course. I generally ended up crowded around a stove wearing every item of clothing in my backpack. Daniel….I would have to take it slow…I don’t really climb any other way! But I totally agree with you, and I think it’s true of all travel. We do it to see and experience…so take it slow and rest, and chuckle, and talk with locals, and get lost, and….have fun! Love this post, and as always love your photos! To be fair, we weren’t taking it slow by choice either, but by necessity. That said, if we hadn’t left ourselves plenty of time to do the trek slowly, we would have never been able to complete it and would have had to turn around. Maybe we could have forced ourselves onward to the point of getting sick, but where’s the fun in that?